Textile production was a major component of the lives of women throughout much of human history. During the Viking era, before the development of efficient mechanized tools, it may have taken the women of the household as much as 8 months of the year to spin, weave and sew the clothes necessary for the household for that year (Andersson 2003). Many different tools were needed for producing yarn, weaving that yarn into fabric, and turning the fabric into finished clothing. 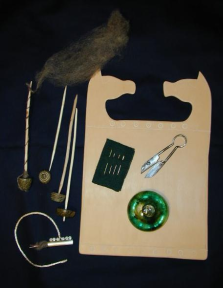 Inspired by a recent book on textile tools from Scandinavia (Andersson 2003), I decided to make or acquire the items that would have been used by an upper-class woman living in south-eastern Scandinavia during the 10th century. As much as possible, I based my reconstructions on information from major Viking trading centers, particularly Birka, Hedeby and sites from Gotland. I have augmented this information with data from other sites in northern Europe, and expanded my research into the early Middle Ages. A few common tools, including iron shears and a glass linen smoother (slickstone) were outside my ability to produce, so I purchased them. The remaining tools in the set - a needlecase and needles, spindles, and a smoothing board for linen - I crafted myself using appropriate materials, tools, and techniques as far as possible. My expertise is primarily in textile production, so I had to acquire many new skills to create these tools, including silversmithing, bone carving and stone carving. Andersson, Eva. 2003. Tools for Textile Production from Birka and Hedeby. Birka Studies 8. Excavations in the Black Earth 1990-1995. Stockholm.